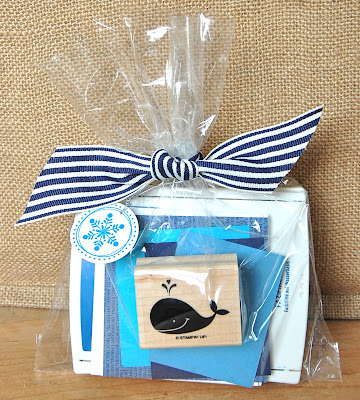 Watching my teenage daughter and her friend have a whale of a time making her party invitations (see yesterday's post) gave me an idea for a Christmas gift. 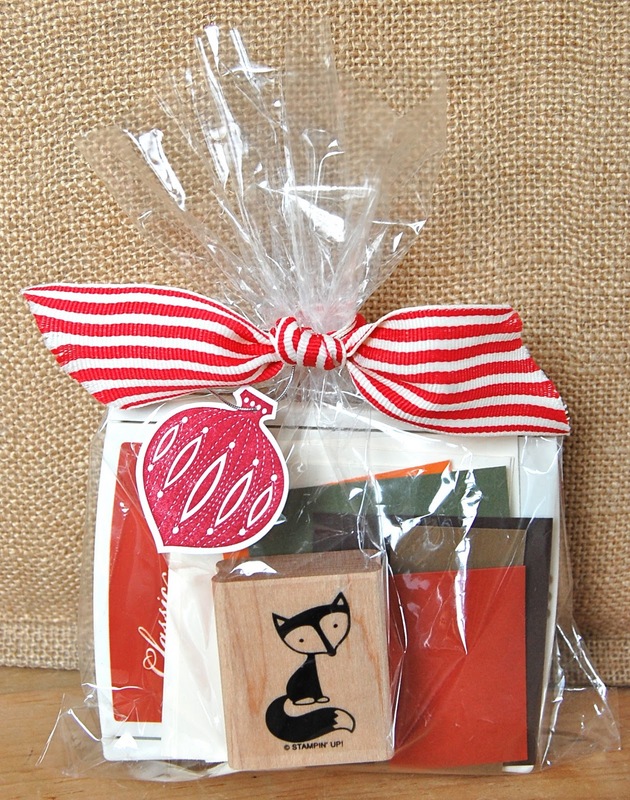 Fox and Friends is a set of seven individual stamps which can easily be divided to make small gifts that don't break the bank. The set costs £16.95, which makes each stamp astounding value at only £2.42! I added an appropriately coloured ink pad to each, some Whisper White/ Very Vanilla 3" x 3" note cards and envelopes, and some card stock/designer paper in the same colour palette. They look rather cute popped into a large cellophane bag and simply tied at the top with a fabulous ribbon - I've used striped grosgrain in Night of Navy for this one. (Going for a similar colour will mean that the recipient will be able to use it when they make their note cards.) I added a festive tag - this one is the snowflake from Season of Joy stamped in Tempting Turquoise on Whisper White card stock, cut out with the 1 1/4" circle punch and attached with silver elastic cord. The ribbon is Old Olive and the tag is made using the tree from Season of Joy. Here's that thoughtful fox (What IS he thinking?!) packaged up with reds, browns and oranges. I used the Real Red striped grosgrain for this one and the tag is the bauble from Contempo Christmas cut out with the amazing Ornament punch - you'll be seeing a lot more of that on this blog! I hope you've enjoyed these gift ideas. Of course Fox and Friends is only one set that can be used in this way - have a browse through the catalogue to find loads more. If you don't have a catalogue - you really need one! If you live in the UK, I can post one to your door for only £4 - check the side bar for a Paypal button or send me an email to order one. I don't know about you, but I'm starting to take Christmas really seriously now! I want all my presents bought and wrapped as soon as possible so that I can relax, spend some time with my family and enjoy all the parties, concerts, plays, fairs and festivities that the season brings. I'll be back tomorrow with some Christmas card inspiration. EDITED TO ADD: I've been asked how much these gift sets would cost: Each stamp works out at £2.42 and an ink pad is £4.95. I put in envelopes that I had in my drawer, plus three note cards made from one sheet of Whisper White card stock and some left-over scraps of designer paper and coloured card stock. So the answer is £7.37 plus whatever else you want to pop in! They can packaged in different ways, but I used the Stampin' Up's large cello bags (3.95 for a pack of 50), striped grosgrain ribbon (£10.25 for a 9.1m reel), various stamps to make tags, and silver elastic cord to attach them (£3.95 for a 22.8m reel). So, how much would the set cost with stamp, paper and inks...? He's thinking: "What the heck is this crazy lady up to now?!" 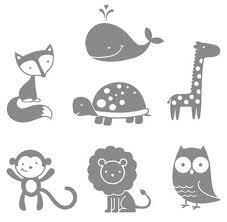 Lovely little gift ideas, those stamps are soooo cute. They were the first SU goodies I bought! WOW, these little gift packs are fabulous! Thanks for sharing this great idea! What a fun gift idea for a beginning stamper. And these cute images and fun colors are especially great for teens. I think these are great little gift ideas. I doubt that I would have ever thought about dividing up a set like that, but what a great idea -- and a fun way to get someone easily started into stamping. You are just too clever!